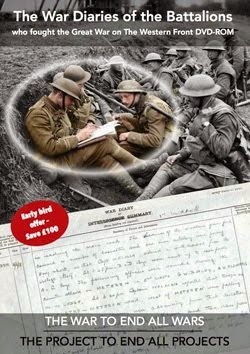 "6019 John Alexander Whitley served with the Royal Irish Rifles. Why did he have such a low number?" When Great Britain went to war with Germany on 4th August 1914, the Royal Irish Rifles had five battalions. The 1st and 2nd Battalions shared the same numbering series which had begun at 1 in July 1881. They were numbering in excess of 10400 by August 1914. The 3rd (Special Reserve) Battalion had its own numbering series and had reached 6457 by July 1914. The 4th (Extra Reserve) Battalion also had its own numbering series and had passed 6700 by the time war was declared. The 5th (Extra Reserve) Battalion again had its own numbering series. I have gaps in my data for the first half of 1914, but by 14th August it had reached 5297. When the 6th (Service) Battalion was formed in August 1914, it continued with the numbering series that was being used by the 1st and 2nd Battalions, as did the 7th through to 16th Battalions when these were formed in September 1914. At least to start with. At some point, somebody in authority must have decided that it would be a good idea if the newly formed service battalions each had their own numbering series. The old series, which was in the 19000s by early October 1914, appears to have been abandoned and new series of numbers were started for each of the battalions from the 6th through to the 16th inclusive. Later in the war, the 17th through to the 20th inclusive would also use separate number series. These new number series certainly start appearing in late September 1914 for some battalions and were in full swing by the following month. Numbers were generally prefixed with the number of the battalion and so the 110th man to join, say, the 14th (Young Citizens) Battalion might expect to see his number expressed as 14/110. However, there are enough examples of numbers being expressed without the prefix to make this an unreliable rule of thumb. All of which lengthy preamble brings me back to 6019 John Whitley. His medal index card shows entitlement to the British War and Victory medals which means he certainly didn't proceed overseas until 1st January 1916 at the very earliest. We can probably rule him out as a regular soldier as this number would have been issued to a career serviceman in 1900; similarly with the 3rd (Special Reserve) Battalion which was numbering in the 7000s by 1908 (these numbers, and the numbers of the 4th and 5th Battalions being a continuation of the series adopted by their respective militia battalion predecessors). 6019 would have been issued to a 4th Battalion man in 1908 and to a 5th Battalion man in October 1915. 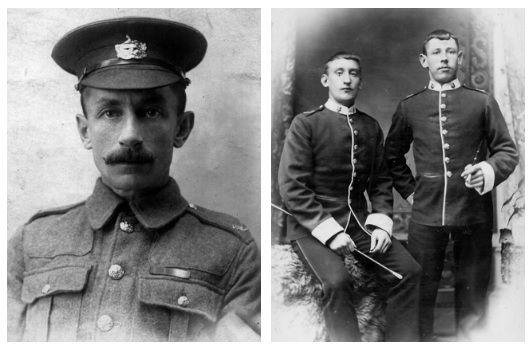 Without knowing John Whitley's age, both these battalions would appear to be possibilities, although I would have thought that had he joined the 4th Battalion as early as 1908, he could well have been posted to a regular battalion when war was declared and therefore be entitled to the 1914 Star, or at least the 1914-15 Star. So of these five battalions, the 5th would appear to be the most likely option. As far as the service battalions are concerned, the 6th to 15th Battalions inclusive all look to have passed the 6019 mark by May 1915 and despite the absence of a prefix on his medal card, we shouldn't rule out John Whitley's service with a service battalion. Unfortunately, his service record does not appear to have survived, but some of the conjecture above could be narrowed down further if we knew when the man was born. HISTORY OF THE FIRST SEVEN BATTALIONS: The Royal Irish Rifles (now The Royal Ulster Rifles) in the Great War. THERE'S a DEVIL in THE DRUM - John Lucy's classic account. Paul, Amazing work. I have been trying to trace information on my great grandfather, John McAfee Rfm. 12/7542 with the 12th Batt. Royal Irish Rifles. I have MIC and medal roll, but no luck with service record. From the MIC he went over after Jan 1/1916. Based on your work did he enlist in the early part or first half of 1915? Some others w/numbers in same number group landed in France in Oct. 1915. Any information or other sources to look at is greatly appreciated. Canuck7542, thank you. My data for these service bns peters out dramatically around May 1915 in most cases and I can only say that looking at other service bn number patterns for the regiment, I'd have a guess at June 1915 as being a likely joining date for this number in this battalion. hi hope you can help. my husbands dad was in the royal irish rifles in ww1 (6th batt) his name was Archibald victor smyth. we were told he changed smyth to smith sometime during the war. I have found great difficulty in trying to trace him. probably because of our name. most grateful if you can point us in the right direction. I couldn't find anyone in the R Irish Rifles with that name combination. There is an Albert Smyth (no battalion given) and a couple of Albert Smiths (3rd and 14th Battalions) but no Albert V or A V Smith/Smyth that I could see. many thanks for your help. we have photo of Archibald in his uniform. he has LG on his left sleeve with a v shaped stripe underneath and 4 small stripes on his right sleeve. no cap badge in photo. dated 1916. we hope to go to the local somme museum which might have some info. again many thanks. The LG signifies Lewis Gunner and the chevron is a good conduct chevron indicating that he had served at least two years (with good conduct). The smaller chevrons indicate service overseas but as these weren't issued until 1918 the dating to 1916 can't be correct. Each chevron represents one year and so I would guess: 1915, 1916, 1917 and 1918.
again many thanks for your help. we have now found a royal irish site and hopefully we can get a little bit more info. Joseph Grant, my grandmother's brother, served and died with 2Bn RIR. His service number is 6746. In his Medal Card, they list him as 4/6746. Given your guidance, I presume he joined the 4Bn early war and was transferred to 2Bn. He qualify for 1915 Star and entered war zone 5 July 1915, France. He died of wounds on 16 July 1916 @ age 19 and is buried @ Rouen. Might you be able to narrow down the month / year Joseph enlisted? His young brother, whom I've not found his Medal Card yet, was reported as being in service with RIR by 1916. I suspect he may have enlisted end 1915 / early 1916. Is there a way to confirm enlistments in RIR from males living in Newry, Ireland (Co Down)? Thanks for the detailed information. 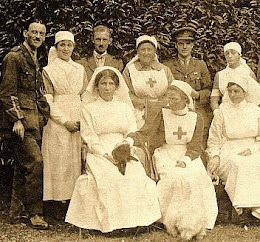 4/6746 does indeed indicate the 4th (Extra Reserve) Battalion, RIR and probably dates to late May or early June 1914 (I have a man with the number 6739 who enlisted on 19th May). A lot of men from Newry would have ended up in the 13th (Service) Battalion which was the County Down Battalion, but of course there would have been Newry men in other battalions too. I wonder if you would be able to point me in the right direction, I am trying to find out what my Grandfathers Service Number was, the only facts that I have is that he was named John Hanley came from Co.Kilkenny, Ireland. I have a document that states he was in the 3rd Bn Royal Irish in October 1915.Any help would be great. The only John Hanley for the Royal Irish Rifles that I found was a man with the number 4681 who served with the 7th Battalion, later 87348 Royal Defence Corps. There is also at least one John Hanley who served with the 2nd Royal Irish Regiment - number 7350 - who was wounded (gunshot wound left arm). Was he definitely Royal Irish Rifles rather than Royal Irish Regiment? The document that I have is hand written, 3rd Bn R I regt is exactly what is written. He survived the war. I believe he was gassed though when I don't know. OK, so Royal Irish Regiment confirms the regiment and I could only find one man of that name of the regiment and that is the man I mentioned earlier. His wounding is recorded on findmypast and his medal index card notes that he also served with the Royal Munster Fusiliers (number G/702). My guess is that he transferred there after he was wounded whilst serving with the Royal Irish Regiment. He was also awarded a silver war badge and this indicates that he was discharged as a result of sickness on 1st September 1917. His enlistment date is given as 3rd March 1915. This date fits exactly with the number range for the 3rd Battalion at this time and so I'm confident that this is your man. That is most certainly him. Paul you are a super star, and I can't thank you enough for all of your help. 1. His name appears in a list of fourteen men "required in connection with proceeedings for desertion. The document in question is just a fragment and is dated 12/08/1915 at Clonmel, signed by the Lieut-Colonel commanding the 2nd Royall Irish Regiment. 2. The second document is a list of sick and wounded NCOs and men at No 10 General Hospital, Rouen who were transferred to the Convalescent Depot on 14th May 1915 (so this pre-dates the fragment above). This is another fragment, a list of over 50 men and your grandfather is recorded as 7350 Pte Hanley, J; 2./ R Ir Rgt; GSW Arm L.
Glad to have been of assistance. 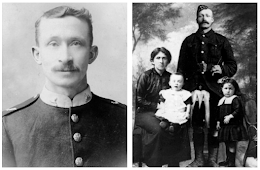 I recommend you get onto findmypast where you will be able to download these two images. sorry Paul for the late reply, I have been away. I took your advice and have done exactly that, without your help I doubt I would have come across these. I am delighted to say the least. The Town that he came from is erecting a Memorial for the WW1 soldiers this year which will display their name's and service number's, your help has enabled him to join the others, to which I truly thank you. I have also been looking for another survivor as he has no known relatives to do so, forgive me for asking you now for a bit of advice about him.His name was John Corcoran also from Co.Kilkenny he was my Grandfathers friend.I have been able to trace him via bdm records and the Irish 1901 census so I know how old he is and the names of his parents, however this time I have no information on his Regiment. The general thought is that the men from here were mainly enlisted into the Royal Irish Regiment, though that is by no means a certainty. I have had a look for his records though sadly with no luck,as a last roll of the dice I am thinking of asking the Western Front Association to do a Pension Record Card look up, before I do I just wonder if you have any other ideas. Thank you your time is greatly appreciated. Hi, came across this site by chance, but as your talking about something that interests me no end, got to ask a question. My grandfathers brother, arthur wheeler, served with the R.I.R in WW1, his dog tags give his service number as 18/1434. I have two ID braclets,one quite plain aluminium with 8th R.I.R, the second a much grander silver plated one with corporal on with 2nd R.I.R. Seems like a very low number, any idea when he may have joined up ? I have large gaps for the service battalions in this regiment but I can say that 18/1434 dates to after December 1915. The 18th Battalion was a reserve battalion, supplying men to the service battalions and, as in your relative's case, to the regular battalions as well. My Grandpa, Private William Bristow 2/7017 (medal card) mobilized for the war on August 8, 1914. According to stories I heard, he joined the army from Belfast in 1903 and went to India for his period of active duty and then returned to Belfast in 1909 or so to serve out his time in the reserves while working at Harland and Wolff. I looked at a list of 2bn posts for the years 1903 through 1909 and none were in India. Do you know of any explanation for the discrepancy? Could he have been in a different unit and then mobilized with the 2bn of the R.I.R.? He survived the fall of 1914 and the winter of 1915 and made it out of France some time in 1915. He spent the rest of the war in Belfast. If he was wounded badly enough to be sent back to Belfast instead of returning to combat I saw and heard no evidence of it when I knew him in the 1960s. He was still vigorous and able to do pushups and go for long walks at age 85. I spent some time shopping for books about the R.I.R. today and looked at excerpts from Lucy's memoir of the 2bn, _There's_a_Devil_in_the_Drum_. I found a story on page 166 about the 2bn being warned they were marching towards a large German formation by a British flying-officer. My father told me the same story decades ago as related by my Grandpa. Grandpa had run into an old comrade on a train in Connecticut who remembered the same event. Given the small number of survivors from the group who deployed in August 1914 that was an incredible meeting. I'll be buying that book and some others. The best book on the 2nd RIR is the history of the 2nd Battalion by James W Taylor which was published in 2005 and which you may be able to get hold of online. I came across here quite by accident but I was wondering if I could get any more help I am trying so hard to trace my family tree, but I am stuck on my maternal grandmother's side, her father was Lance Corporal William Haughton, service number 1330, badge, number 597,of the Royal Irish Rifles he enlisted in November 1914 and was discharged in 1916 with a gunshot wound to the thigh. That's all i could find on him I have exhausted my efforts to find out more about his wife, no one seems to know her last name all they know is that it was Mary, would there be any military records with the names of dependents of family members that might mention her name, sorry if this is a stupid question but you seem to be a lot more knowledgeable in this subject than I, thank you for your time. Chelseagirl74, the best bet would have been surviving service papers in WO 363 or pension papers in WO 364. However, I do not think anything survives for him there. Some regiments also hold enrolment books for the period and in any event I would have thought that an enquiry to the RIR museum would be worth a shot. The regiment became the Royal Ulster Rifles in 1922. Try contacting them here: https://www.royal-irish.com/museums/royal-ulster-rifles-museum. Thank you so much, sorry for my late reply. Tes, some will survive in series held at the National Archives, WO 97, WO 363 and elsewhere. looking for information on my great grandfather Private Michael McGuinness, Belfast. He was in Royal Irish Rifles 2nd Bat. No. 9062. Please drop me a line via the RESEARCH tab, Gerard. My Grandfather CSM Richard Southam served for 22 years with the Royal Irish/Ulster Rifles enlisting on 23rd July 1901 in Birmingham and finishing his service on 9th Feb 1923 in Cairo. His service number was firstly 6/6401 then 7006215, he was wounded in France and then in Dublin during the uprising and was also a POW in Stendal, Germany after being captured in Cugny, France on 24th March 1918. Can you tell me were he would have been stationed between 1901 - 1914 please, i know he was in Victoria Barracks, Belfast in 1901 and Tidworth when 2 of his children were born but what overseas postings would he have been on? Many thanks. Hi I have been searching for a great uncle of mine called james mccalmont from ballyclare Co. Antrim but can find a service number for him or the battalion have searched through old papers and find nothing on him as apparently he was wounded several times. Can u help? Re James McCalmont, it looks as though there are two men of this name who served overseas with the R I Rifles. At least one of these men lived at North End, Ballyclare, Belfast. Drop me a line if you want to pursue the research option. See RESEARCH tab. 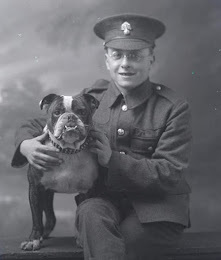 Hi I am trying to trace my Great Uncle for my mum who is 85 yrs old so that we can visit his war grave on the 100 yr anniversary of his death managed to pin it down to two possible candidates. Re Patrick McNamara lived in Liverpool and was age 13 on the 1911 census, his father was called Patrick and Mother Mary Ann, brother John, and sister Bridget were 11 and 15yrs on 1911 census with several other siblings. The two regiment number I have are L/13354 and 6746, he was ? 17 when he enlisted and mum thinks he was killed in the Somme. Thanks for your comment regarding Patrick McNamara. In the past I would freely have looked into this and come up with the answer you need. However, because so many people who post on here do not have the good manners to even reply when I provide an answer, I took the decision a couple of years ago to only provide a paid research service. This is clearly state when people leave a comment: "Please note that if your comment concerns research about a particular individual, you should read the RESEARCH tab at the top of the page." Thank you Paul unfortunately due to records destroyed by fire there are only partial records available so I am unable to match up age of the two possible candidates thereby eliminating one of them my relative was born was born Jul/Aug/Sep 1897 so I will continue researching all possible sites and if all fails then next year we will visit both graves to pay our respects. It is sad that so few people have manners, thank you for your response. Your great uncle was the man with the number L/13354. I checked the soldiers' effects register and this lists his father as Patrick. The other man has relatives whose names do not match the ones you gave. Regards and best wishes Gary. Gary, there will be the usual sources to check: medal card, medal rolls, soldiers died in the Great War, CWGC, soldiers' effects register, Ireland's memorial roll, Irish soldiers' wills These records should survive for this man. In addition there may also be a service record. Drop me a line if you need help. Hi Paul, I have read your 'numbering' report and I wonder if you can simply answer a query based on your knowledge of the numbering system used. A star awarded on the 14/1/1915 to a Sgt 5/5091, is his number likely to indicate he had previous military service prior to WW1. His medal roll (only records found) indicates he served in Royal Irish Rifles 2nd (service) - 5th (service) - 7th (reserve) - and 5th (service). Hopefully you may be able to assist? It's a number from the series used by the 5th (Extra Reserve) Battalion, Simon, and dates to 1912. The 19th was a reserve battalion, Ralph, and never served overseas. His number indicates that he joined this battalion but if he did serve overseas he must have been posted to another battaloion first. The medal rolls on Ancestry may reveal more.